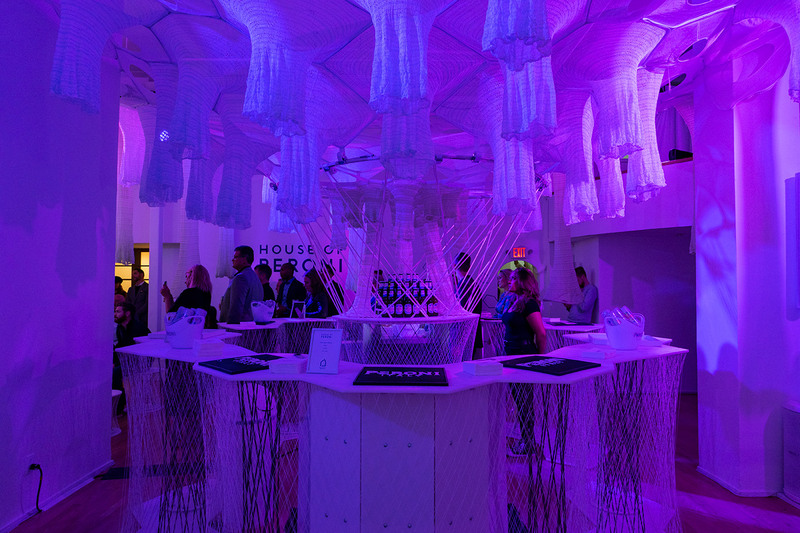 The 2018 House of Peroni art popup is now open to the public, and at the preview event on October 18 in Manhattan, guests had the chance to wander through Jenny Sabin Studio’s hanging textile sculptures and snack on sugar sculptures. This year’s installation, LUSTER, which was curated by the nonprofit Art Production Fund, presented a more intimate, and refined, version of Sabin’s 2017 Lumen installation for the MoMA PS1’s Young Architects Program. 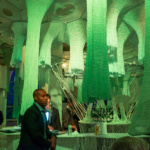 The exhibition encompasses a bar serving up beers and cocktails from Italian beermaker Peroni, as well as functional seating and tables from Sabin. 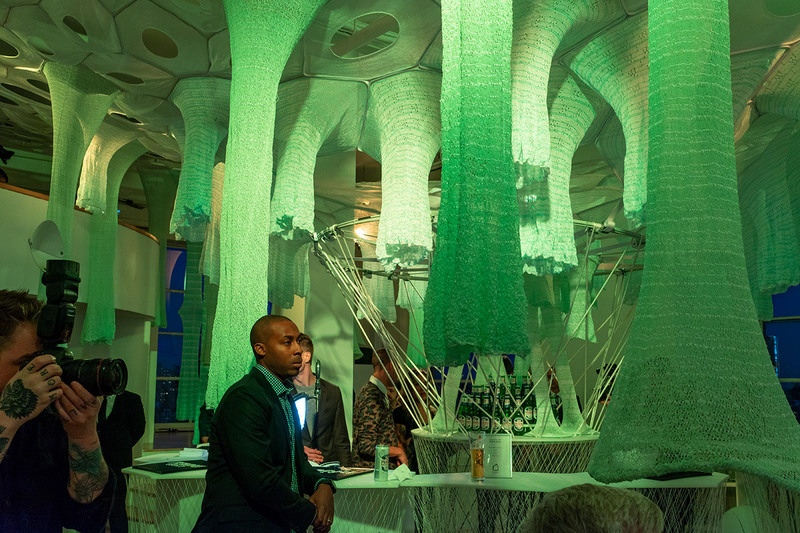 A woven canopy of photoluminescent materials, reflective textiles, and tubing has been lit with color-changing lights, creating a constantly shifting environment. 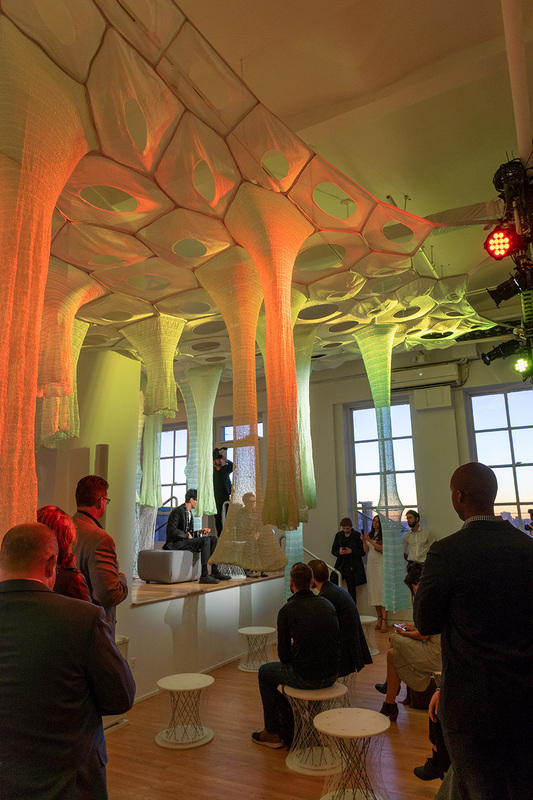 The cell-like structure of the canopy, strung from supports just below the ceiling, both filters and diffuses sunlight during the day and seems to pulse when lit at night. 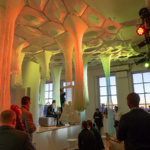 “Tubes,” some defined and others deflated, hang down from the installation and encourage visitors to mingle around and touch them. Depending on the lighting, the effect varies from being inside of a cave, to drinking beer in a dense forest surrounded by tree trunks. 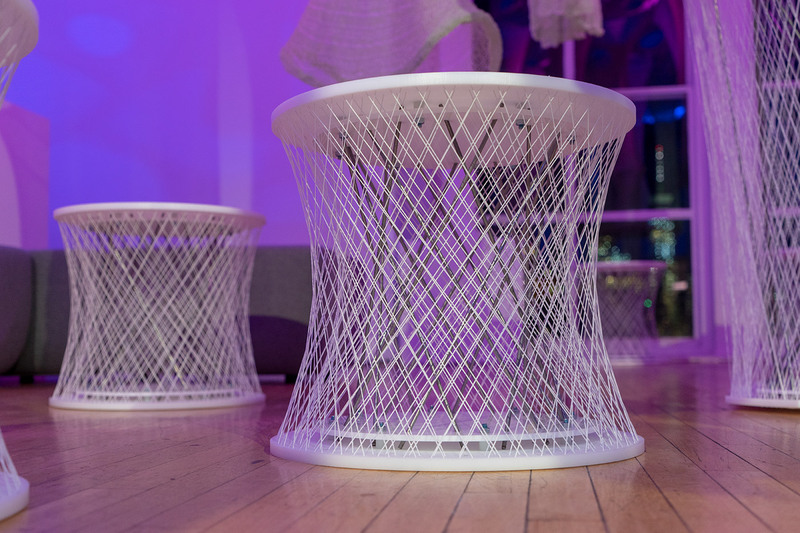 Even the spool stools were given an update, their solid cores replaced with spindly, rebar-like supports. 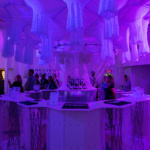 The same basic form of the stools was also elongated to form components of the central bar and taller tables. 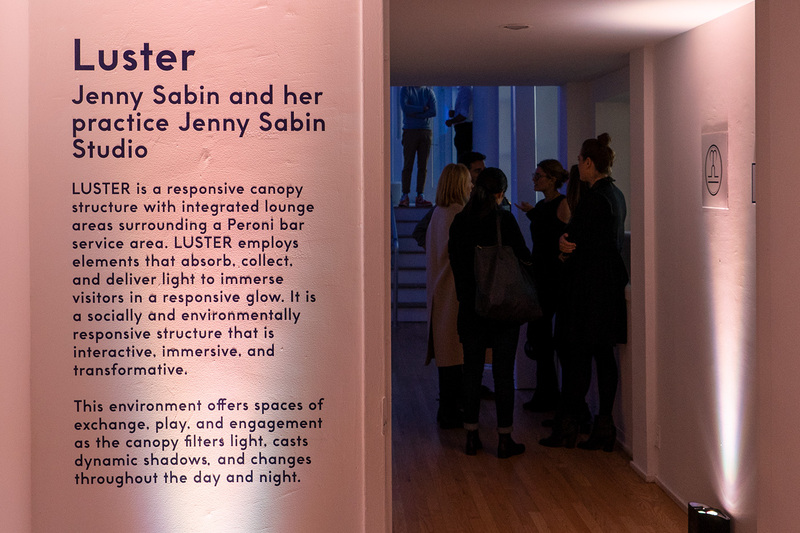 LUSTER was fabricated under very different constraints than the courtyard condition of Lumen. 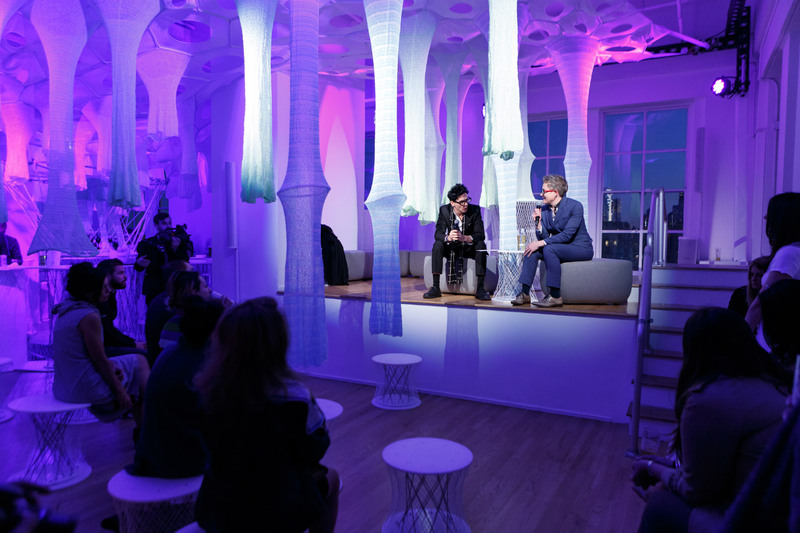 In a discussion at the House of Peroni with GSAPP’s Christoph Kumpusch, Sabin discussed the technical challenges of bringing such an installation to an enclosed space and designing it to travel. 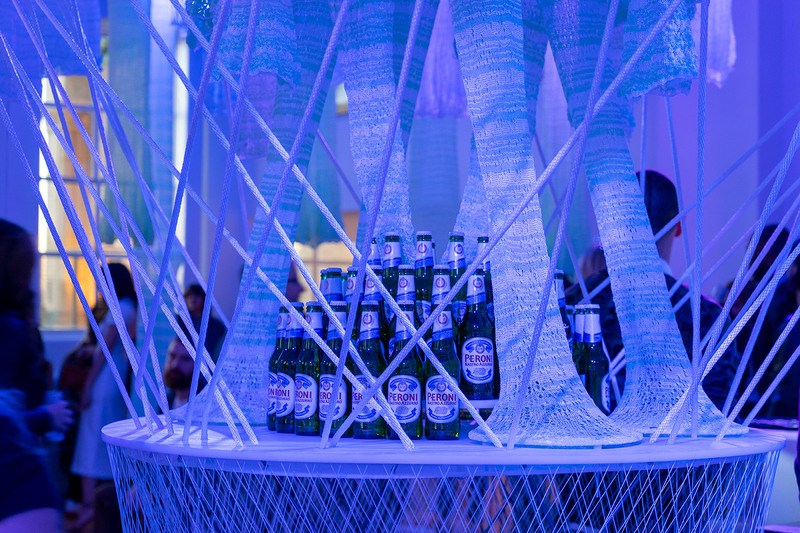 After New York, Peroni will bring LUSTER to Los Angeles, Miami, and Washington D.C. 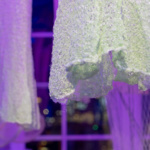 The entire canopy zips up for easy transport, and everything was built to fit the specific site. 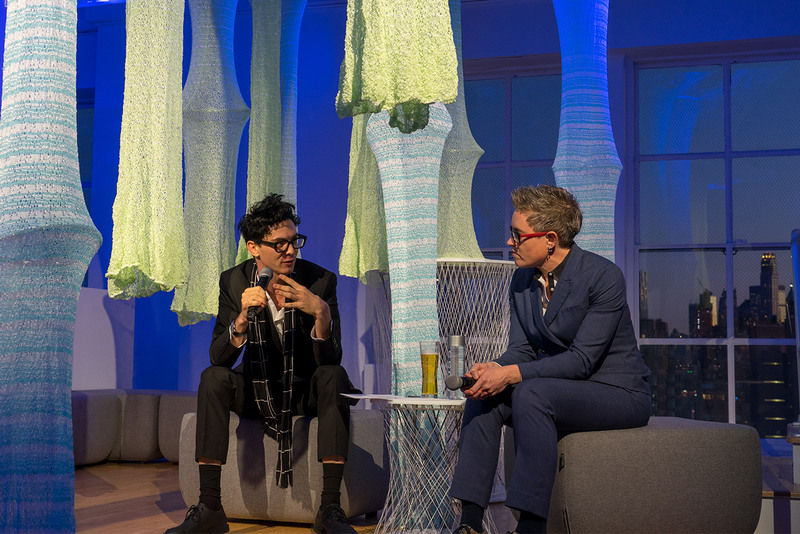 Kumpusch and Sabin also touched on the way that LUSTER openly presents boundary conditions and exposed edges, as well as how the fluid nature of fabric works as an analogy for gender. 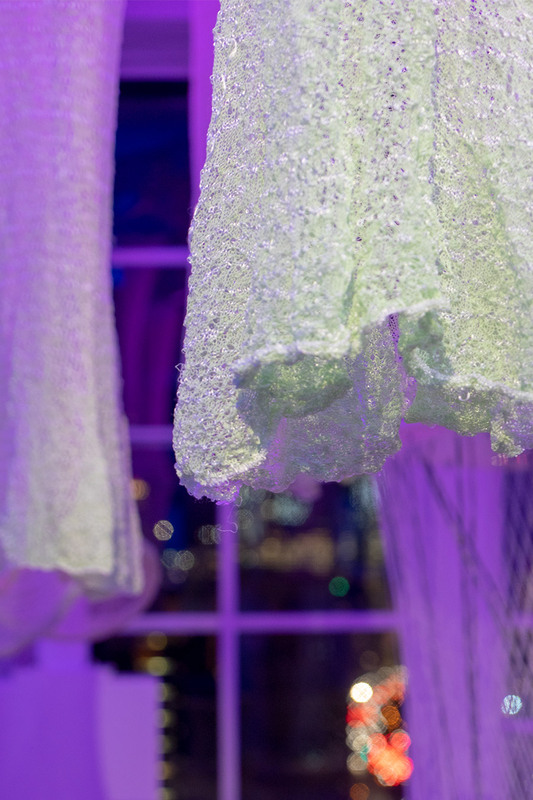 In terms of the craft itself, Sabin was quick to point out the storied history of textiles and their tangled history with technology—the first punch cards were developed to guide looms, which evolved into the calculator, mainframes, and more, paving the way for modern computing. 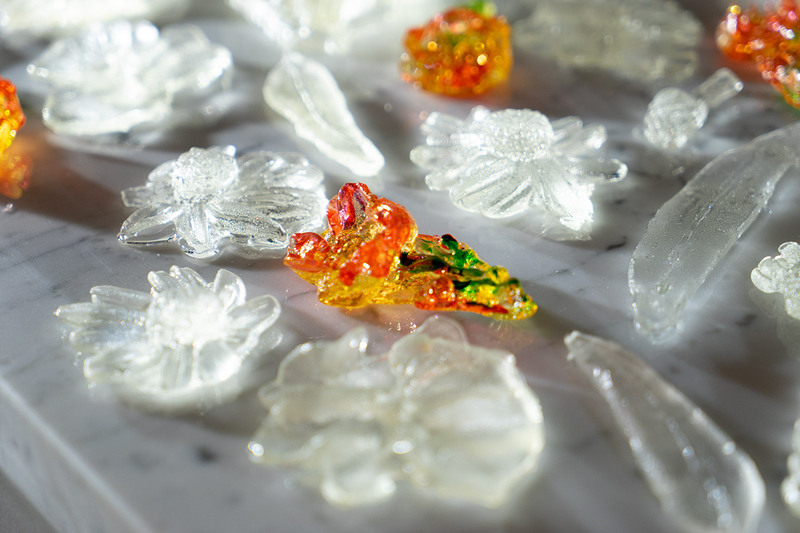 Also present at House of Peroni 2018 was Glass Garden Lost & Found: Of Healing & Knowledge, an exhibition of carved sugar flowers from candy artist Maayan Zilberman. 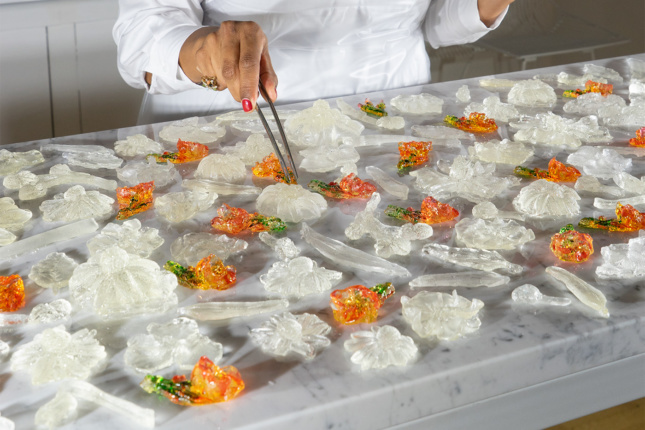 Mixing live flowers with candy facsimiles, Zilberman’s Peroni installation references the Orto botanico di Padova garden in Padula, Italy, a garden famously known for its collection of both medicinal and poisonous plants. 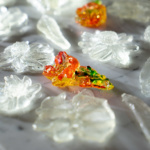 The live flowers take on the healing, medicinal role, while the sugar flowers represent the deadly, artificial constructs created from human knowledge. 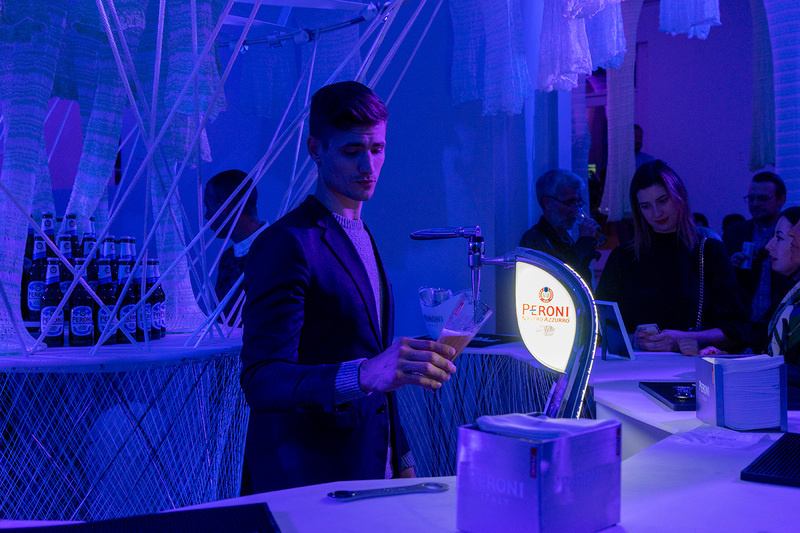 House of Peroni 2018 will run through October 20 in New York, and then move Los Angeles on November 8, Miami on November 14, and end in Washington D.C. on November 28. 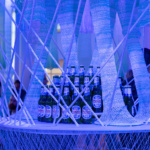 Tickets and more information can be found on the House of Peroni website.